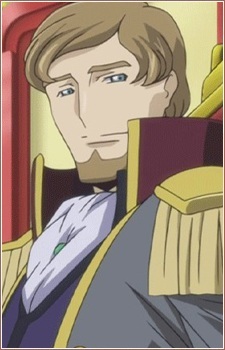 Odysseus eu Britannia is the First Prince of the Holy Britannian Empire. Though he is the Crown Prince and first in line to succeed the throne, his performance in many areas is quite plebeian compared to that of his younger siblings, particularly his brother, Second Prince Schneizel. He is engaged to Tianzi, the much younger Empress of the Chinese Federation, in a marriage of political convenience orchestrated by Schneizel in order to peacefully seize the Federation's territory.